Potter Passion Prevails! That is the thought of these three reporters from Harry Potter Fan Zone, as we observed and participated in The Leaky Cauldron’s third conference, LeakyCon 2012, at the Hilton Towers in Chicago on famed Michigan Avenue from Thursday, August 9 – Sunday, August 12, 2012. The 3800+ fans overtook the Hilton hotel as they roamed the hallways and lobbies dressed in both normal and Potter gear. Huge LEAKYCON banners draped the inner lobby of the Hilton and a Hogwarts castle-like backdrop was displayed on the main stage area to help get us in the mood. 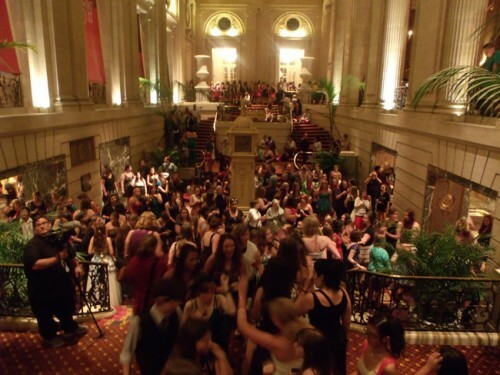 The number of attendees was overwhelming, this being the largest LeakyCon conference, beating last year’s conference in attendance by approximately 800. This itself says something about the excitement that LeakyCon permeates as Chicago boasts no Potter-themed attractions – which means that all 3800 people came for the conference itself. As conferences go, we can honestly say that we have never experienced the immense amount of passion and excitement from attendees that we witnessed here. Harry Potter brought together all the attendees in friendship and The Leaky Cauldron web site has helped to cultivate and grow Potter Passion which J.K. Rowling started over 15 years ago – for some of the fans present, they were just barely born but yet they mingled with other Potter fans from near and far at this conference. We could sense the feelings of bonding and closeness with those who feel as passionate about the Potter saga as we do. Our first day, Thursday, August 9, we had the wonderful opportunity to sit in on two press-only conferences, first with some of the actors from the famed “Star Kid” troupe and secondly with the Harry Potter movie actors that were present at the conference which included Robbie Jarvis (the young James Potter), William Melling (Nigel Wolpert), and the ever-friendly, bubbly and lovely Evanna Lynch (Luna Lovegood). 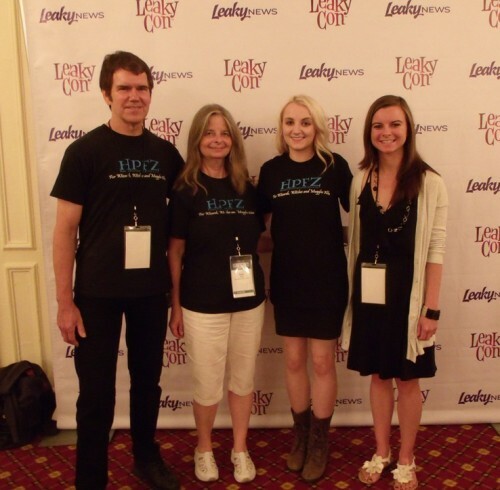 Our HPFZ reporter sat with Evanna for several minutes asking her various questions and Evanna’s sweet and humble nature came forth as she talked about her identification with the character of Luna and what Luna has done for her personally. Also on the first day was the opening ceremony which lasted a mere two hours and included a little bit of everything including a great video to introduce the conference that also showed photos from last year’s conference. The four Potter stars (three mentioned above in addition to Louis Cordice who played Blaise Zabini) appeared with loud enthusiastic applause and screams – they performed unique and humorous dialogs to the delight of the audience. In addition, there were MuggleNet personalities, a Potter Pals Puppet show, musical offerings from various Leaky Stars, words of wisdom from Andrew Slack of Harry Potter Alliance, a performance from Harry and the Potters and many special encouraging words from our “Headmistress” behind the scenes of not only LeakyCon but also The Leaky Cauldron website, Melissa Anelli, without whom none of this special and unique brand of fandom would be possible. The first day concluded with great Wizard Wrock concerts. ￼￼￼￼￼￼￼￼ Days two and three were filled with various offerings of programming to satisfy everyone. Well-known authors and speakers such as Valerie Frankle delighted us with her offerings on various topics including a comparison of Potter and Hunger Games; NY Times best-seller Lev Grossman participated in LeakyCon Lit; Mark Oshira shared his Mark Reads Harry Potter; HPANA website broadcast Hogwarts Radio; the Dean of Harry Potter Scholars, aka Hogwarts Professor, John Granger, offered presentations in four 2-hour sessions including his famed “Ring Composition Analysis” and a new “10 Things You Did Not Know about Each Harry Potter Book”. Other presentations were round table discussions that got the crowd talking and discussing issues, such as our own David James Gras who presented “PhoenixSong and the Order of Virtues”, “Harry Potter Travels” roundtable with notable travel agencies such as Beyond Boundaries Travel being represented and The Ethics of Severus Snape by Nancee Lee–Allen. While many exercised their minds with these presentations, others exercised their bodies with classes such as Yoga with Evanna. The Vendor room offered a myriad of things to purchase in the Potter world including artwork by very talented artists such as Casey Robin, and other offerings from vendors such as the Hungarian Wand Shop, Ghost Toast jewelry, Ambrosia candies, books by various authors, both self-published and professional, and various potions, bangles and baubles to add to our Potter collections. Charities abound at LeakyCon and we were honored to be a part of an organization that supports Harry Potter Alliance, BookAid International and The Star Won’t Go Out. See the Charity page for more info. Leaky Con’s own conference in Portland, Oregon in late June 2013. LeakyCon 2012 was staffed by dedicated and hard-working staff and volunteers, all sacrificially giving of their time and talents to make this conference so successful – amongst them being Jennifer Clack, Head of Entertainment and Programming, Maureen Johnson, LeakyCon Lit Director, and our own contact, Katie Burnside, Communications Co-Director. We were amazed and awed that it all came together successfully – our highest esteem goes to Melissa Anelli and Stephanie Dornhelm, Co-Founders and Executive Directors, and their dedicated staff who worked endless hours for the Perpetuation of Potter Passion!